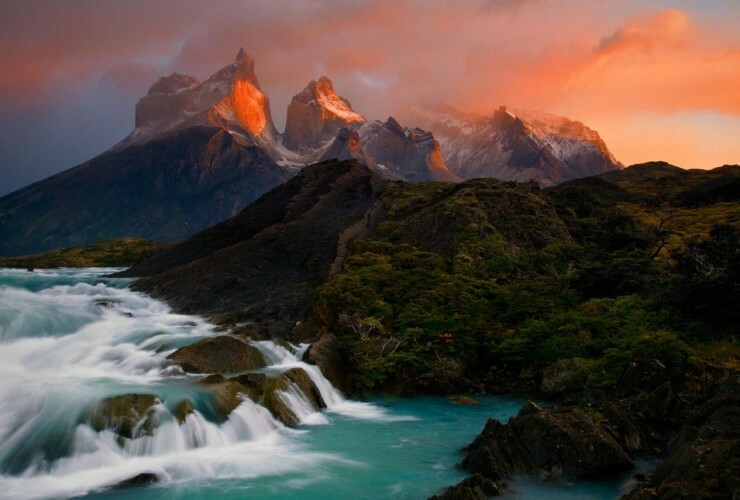 A vast continent, South America provides truly unique natural wonders to discover and explore. This time we have chosen ten of them, that have caught our attention. These beauties are worth seeing at least once in a lifetime. Found on the one of the smaller islands of the Bahamas, the beach provides a perfect place to sunbathe and swim in the warm crystal clear water. But the most impressive thing about it is a 5 km (3 mi) long stretch of soft pink sand! It makes it one of the most unusual beaches in the world. The light rose color is a result of foraminifera – a marine animal – and its red shell, which crushes and later mixes with the white sand. The largest lake in South America is found high in the Andes, neighboring two countries. It is home for 530 aquatic species, water birds and more: since ancient times people lived here too. Not only the lake is surrounded with small villages. 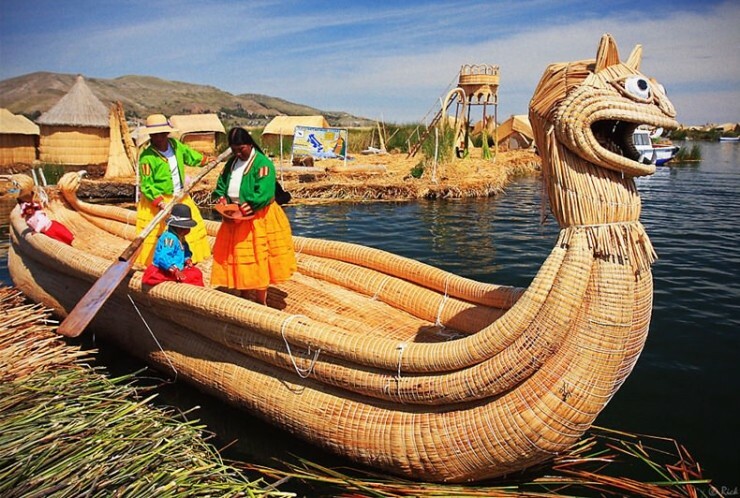 There are unique 44 artificial floating islands, inhabited by people, known as the Uros. The locals live from fishing and tourism, since the islands are part of the Titicaca National Reserve and are the main tourist attraction. The 1601 m (5253 ft) high volcano and its surroundings are indeed very appealing: the versatile landscape looks quite unearthly. On the northern side of it sprawls the Salar de Uyuni , on the other side there is a lot of greenery and pastures, where lamas graze. Tourists have an opportunity to climb the mountains and approach the Salar from above. The flat looks like a mirror after rain, therefore do no be reluctant to travel there during the rainy season. A 155 km (96 mi) long mountain valley, carved by the Rio Grande, is indeed a spectacular place. Populated 10,000 years ago, it later served for the Inca Empire, who managed to turn this site into a complex trade route. Today it is enlisted as a World Heritage site and protected by UNESCO. Although its cultural prominence is much more valued, the natural beauty of the colorful mountains is also worth mentioning. The area can be explored on a one to three days lama trekking. Garganta del Diablo is an impressive canyon with a waterfall, while El Pucará provides a wonderful panoramic view. Both places can be easily reached from Tilcara. Settled on the southern coast of the country, Nazca fascinates with its vast valleys and the most enigmatic phenomena in the world – the famous Nazca Lines. The advanced Nazca culture existed between 100 BC and AD 800. Ruins of the ceremonial city of Cahuachi and developed underground aqueducts are also a testament of this progressive culture. The purpose of such a unique creation is in dispute. Scientists think that it served for the religious and astronomical reasons. Today travel agencies offer flights over the Nazca Lines, that can be admired from the air only. If you thought that riding a swing is for kids, think again. Here is the wildest swing in the world: the swings hanging from Casa Del Arbol above the abyss attracts many brave adventurers. The treehouse actually is a seismic monitoring station. From here an incredible site of the Cordillera Real and an active volcano Tungurahua opens. The hikers reach this spot on their way to Bellavista viewpoint. The swing is simply made of a metal beam attached to a rope. No safety belts will keep you from falling down the abyss. However, the bravest hikers take their chances and enjoy the exciting experience. Definitely worth trying at least once in your lifetime! The park’s mission is to preserve the wonderful environment, unspoiled nature, fauna and flora. At the heart of it is the most precious gem – Kaieteur Falls, whose plunge drops for 226 m (741 ft) down the steep cliff. Its average flow rate is among the most powerful in the world. The whole experience is truly unique and unforgettable: the visitors who are keen to see the single-drop waterfall have to find their way through an ancient misty rainforest. One of the most impressive waterfalls on the planet – it is beautiful, surrounded with pristine nature and has an unbelievable geological history. The park fascinates with stunning, unspoiled nature and therefore attracts hundreds of thousands of tourists each year from all around the world. The landscape here varies from rivers to lakes, from glaciers to mountains, whose peaks create a dramatic skyline. The park is a popular hiking destination, which provides plenty of routes. There are mountain huts, that accommodate hikers, who have committed for the longer trails. In addition there are various other activities: kayaking, mountaineering, horseback riding, fly fishing and sailing. The park has all the facilities needed for a nice visit to the park. It is the biggest salt flat in the world, which stretches for 4,086 sq mi (10,582 sq km). The salt desert used to be covered with water. Several prehistoric lakes were lying here. After a long time however, the lakes have disappeared, uncovering this amazing spot. The area which is covered with a few meters salt crust is extraordinarily flat. Due to this and clear air, as well as low humidity, Salar De Uyuni is perfect for satellite calibration. The unusual spot attracts tourists from all around the world. Some hotels are built entirely with salt blocks. Not very tall (285 ft/87 m), but very impressive: it has 275 cascades, that form a horseshoe and stretch for 8858ft (2700 m). It is taller and twice as wide as Niagara Falls. Iguazu Falls are surrounded with national parks in both countries. Fed by Iguazu River, the beautiful falls are of volcanic origin. Admire one of the most beautiful waterfalls in the world, which constantly is enlisted among the top falls.